Wu Guxiang, whose works are now quite rare, was one of the leading Orthodox School painters in Shanghai, and his landscape style derives ultimately from the Ming masters Wen Zhengming (1470-1559) and Tang Yin (1470-1523). He is known to have painted sets of seasonal landscapes and this winter scene may belong to such a group. The inscription discusses past theories of landscape painting. 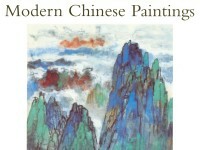 Wu Guxiang was one of the leading painters of the Orthodox School in Shanghai. His landscape style is said to derive from the Ming masters Wen Zhengming (1470-1559) and Tang Yin (1470-1523).